From 26 January – 4 February, Sally Ducrow and Marina Kulik showed their latest paintings and sculptures, as well as artwork especially created for the occasion, in the Salle Esprit in Valbonne. 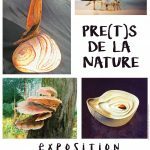 The exhibition was an idea of the Town Hall of Valbonne, in search for an art exhibition to promote recycling. The French title, which means both ‘borrowed from nature’ as well as ‘close to nature’, covered te content: sculptures and reliefs created out of wood, stone and carton, watercolour paintings from natural pigments on cotton rags-paper and all subjects within the theme ‘The Elements’ (Earth, Water, Air and Fire). 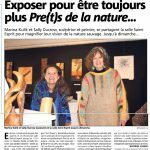 The exhibition was received with great enthusiasm, with an official opening by the mairie, many articles in the newspapers and a record amount of visitors for the time of the year.